I am ready for Farmer Bob to have a show with each letter of the alphabet! With our Kindergarten lessons this year we are going through the letter of the week and this DVD is fantastic for tieing in three important things.. a letter, an animal and the best.. A Bible Story! This DVD is funny, entertaining, very well written and yet it gives us an excellent message that young children can understand. "Porkchop the Pig teaches the story of the Prodigal Son in a funny and memorable way! Wacky animals and their hilarious antics will have kids rolling with laughter as they watch the story of Porkchop (Randy Travis), a pig with dreams of making it big in the music business—no matter the cost! Farmer Bob gives Porkchop the money he needs to follow his dreams, but the friends Porkchop makes in the big city don’t turn out to be as nice as he thought. When Jenny the sheepdog (Amy Grant) and some of the other animals save the day, Farmer Bob welcomes Porkchop home with open arms, and even Hercules the tough-talking rooster (Vince Gill) learns the value of forgiveness. Bonus educational features include a music video and cartoon based on the letter P, a read-along digital storybook that lets kids decide when to “turn the page,” and an option to view the entire Prodigal Pig DVD with pop-up Ps every time a word that begins with P is used! A literacy message to parents is also included. More bonus features include bloopers, character commentary, and a behind-the-scenes look at how Farmer Bob’s farm was created! 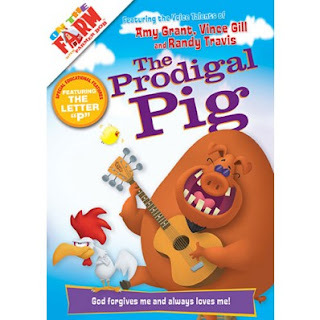 Based on the Parable of the Prodigal Son, this funny and educational DVD will have kids laughing and learning along with their favorite farm critters!" Enter to win your copy from Tommy Nelson below! the story of Samson and Delilah as told by the Strong Saint Bernard and the doe-eyed deer. This will be great for my granddaughter thank you for having this giveaway and thank your sponsor. Thanks for all your great information will get to use everyday.